By now, most of you know we are fans of Rita McGrath. Rita was featured in our special thought-leader session, The End of Competitive Advantage. We agree with her message of thinking differently about competitive advantage and creating a “new strategy playbook” for today’s hyper-competitive, fast-changing economy. What you might not know is that we escorted Rita to Maryland as she just got back from Davos and the World Economic Forum. The southbound trains from New York City were delayed and unpredictable that day, so we had a driver come up and take us all southbound to Maryland for her session the next day. For me, it was a thrill being able to chat with the woman who was recently named the sixth most influential business thinker in the world and one of the top 25 smartest women on Twitter by FastCompany magazine. Rita was full of nuggets of wisdom from Davos and her experiences consulting with businesses all over the world. Rita’s advice to our CPAs and to the world in Davos is the same: in these disruptive times, our competitive advantage(s) can and are fading faster than ever and we need a “new strategy playbook” to deal with them. If I can sum up her new playbook in one word, it is agility. We need organizations and people who are agile and resilient, capable of bending without breaking, and quickly adapting to market and competitive forces. So what does “agility” look like in action? Pictured above is Rita with her CEO panel in Davos. 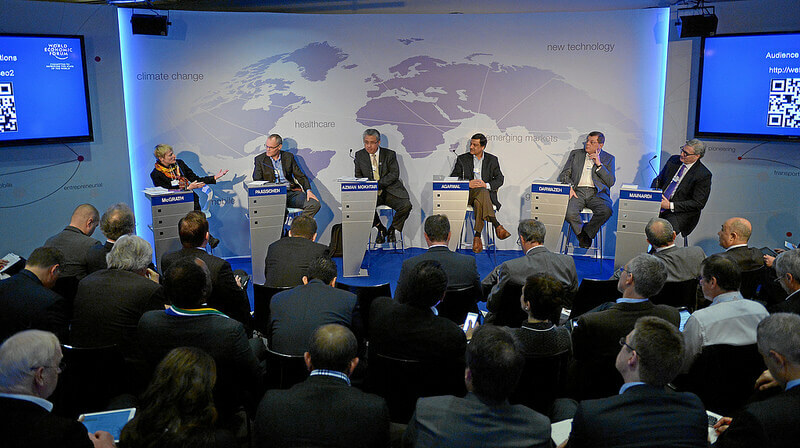 The panel consisted of: Anant Agarwal, president of EdX, USA; Azman Mokhtar, managing director, Khazanah Nasional, Malaysia; Mazen S. Darwazeh, vice chairman and CEO, Middle East and North Africa, Hikma Pharmaceuticals; Senator Jordan; Cesare Mainardi, CEO, Booz & Company, USA; Frits D. van Paasschen, president and CEO, Starwood Hotels & Resorts Worldwide, USA. It is impossible to be agile without an extremely strong set of core values and common commitments. This allows local action to be taken without going beyond the vision of the firm. There is no substitute for being externally focused. Each company had practices that both stabilized and destabilized their organizational structures. Driving agility by a fanatical focus on what customers are trying to accomplish was another key theme. Start with “why” — purpose and values matter in disruptive times. Fast and roughly right beats precise and slow. Focus on the customer and the future. Be prepared for constant change. It’s OK to experiment and fail, as long as you are learning. What’s your silver (the Kodak story). More insights from the crowd can be seen on this tweet report from the session, which reached 64,104 people and had 2.1 million impressions! What sticks out for you on these two sets of insights? Buy Rita’s book, The End of Compeitive Advantage, follow her on Twitter @rgmcgrath, and follow her blog.